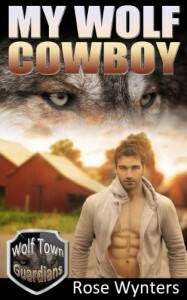 My Wolf Cowboy was definitely a fun and wild ride! Connor has finally found his mate, a beautiful young gal named Natalie. Natalie is amish, but shes tired of being bossed around by men and being married off like property. In the span of a few hours Natalie's entire life changes drastically all thanks to Connor and some aliens. Yes, aliens! Connor of course is sweet and lovable, he reminds me of the classclown with a good heart. You get to see the real depth that resides in Connor as the book progresses. Natalie is an interesting heroine, shes not weak, but she is extremely thoughtful. She's learning to open up and be more trusting of people. I found these two to be one of the sweetest couples I've read about from any series. AS per usual, you get more residents from Wolf Town including Alexander an Caroline, Ivan and Elena, Marrok and Mary, but you get some new younger faces as well introduced. Werewolves, aliens and the amish add a funny and interesting twist to this tale. I'd definitely recommend to PNR lovers, and werewolf fans alike. This is an 18+ book.